Malaysian troops are searching houses and terrain for armed members of a Filipino clan embroiled in a three-week conflict in Sabah on Borneo island. Police say one gunman was shot in brief clashes early on Wednesday, though it was unclear whether he had been killed. On Tuesday, Malaysia launched a raid on the group with troops and fighter jets, but the clan said they had escaped. The conflict has already left at least 27 people dead, and put pressure on both governments to resolve the crisis. Some 200 Filipinos landed at a coastal village in Sabah's Lahad Datu district last month, saying that the territory was theirs. Calling themselves the Royal Army of Sulu, the clan members said they were descendants of the Sultanate of Sulu in the southern Philippines, which ruled parts of northern Borneo for centuries, and demanded that the Malaysian government pay more money to lease their land. A two-week stand-off ensued, but violence broke out in at least two places late last week, leaving eight members of the Malaysian security forces and 19 clan members dead. The military assault was launched on Tuesday, but Malaysian officials confirmed late in the day that they had not found any of the clan members during the operation. On Wednesday, the security forces widened their search, saying there were signs the group had moved elsewhere. Gunfire was exchanged in a hilly area early on Wednesday, Malaysian officials said, with one clan member believed to have been shot. It is not clear whether the clan member was killed. "The security forces are tracking down their movements and will take the appropriate action," police inspector-general Ismail Omar told reporters. Bernama also quoted him as saying that the Filipinos were now "impersonating as members of the public" to evade Malaysian troops. But he insisted the security forces were "in a good position" and urged people in the region not to panic. For their part, the Philippines' Foreign Ministry said in a statement on Wednesday that they had no information on the number of casualties from the latest assault. 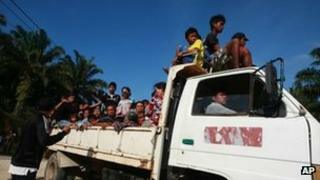 It said the Philippines "continued seeking the exercise of maximum tolerance to avert further loss of lives". Foreign Secretary Albert del Rosario returned to Manila late on Tuesday after holding two days of talks with his counterpart in Kuala Lumpur. "We did everything, we walked the last mile. We intend to fully continue this effort," local media quoted him as saying. The Manila-based leader of the Filipino clan, Jamalul Kiram III - who claims to be the current sultan of Sulu - has said they are prepared to "fight to the last man". On Wednesday, he told AFP he had spoken to his younger brother, who is with the clan in Sabah, and that they would not surrender. "He was telling me they are eating good food, but the hard thing is they are being chased. So where will they go?" he said. Kiram's daughter in Manila told Reuters the group were unhurt and insisted: "Malaysia wants us dead, and all we want is to talk." Meanwhile, residents in the area have spoken of their fears that the conflict could escalate. "If there are no more negotiations I think more people on both sides will die," Shamsul Bahari told AFP, saying he was too scared to go to his job on a palm oil estate. The stand-off poses a challenge to both governments. Malaysian Prime Minister Najib Razak has come under increasing domestic pressure to end the incursion, while the Philippine government is facing calls to do more to protect the Filipino group. Sabah formed part of the Sulu Sultanate - which once spread over several southern Philippine islands as well as parts of Borneo - before it was designated a British protectorate in the 1800s. Sabah became part of Malaysia in 1963, and the country still pays a token rent to the Sulu Sultanate each year. How do you solve Sabah problem?